are novel and without G6PD deficiency liabilities. Novel, robust and validated in vitro or in vivo models of vivax liver stages are sought that are suitable for immediate compound testing. Please see the criteria for P. vivax for specific details. No evidence of genotoxic or developmental issues along with a plan to continuously examine these aspects during the Discovery phase and also once a preclinical candidate is selected. For advanced series, we are seeking compounds with, ideally, a predicted human half-life >100h and a predicted single human dose <1g. If resistance is confirmed then MMV would welcome the opportunity to add a resistant clone to our screening panel. Templates for the 3-page Letter of Interest and 1-2 page Submission of resistant strains can be found in the right-hand column of this page. 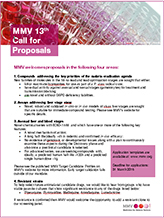 All applications using the specified templates should be sent to proposals [at] mmv.org by 12 noon CET Tuesday, 31 March 2015.